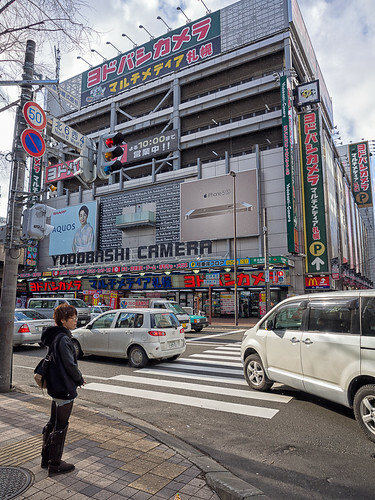 As luck would have it (my kind of luck) the first location I came to just outside of Sapporo train station was Yodobashi Camera. I literally stumbled upon the building, and it took me several moments before the brain realized what it was I was looking at and that I’d been asked to visit there by Matthew Robertson. The irony of finding this place so quickly, if accidentally, was that Matthew said that I should visit the place in an email before my trip started. I looked it up online, but all I found was the Tokyo location. Having found it, I had to take a look inside. 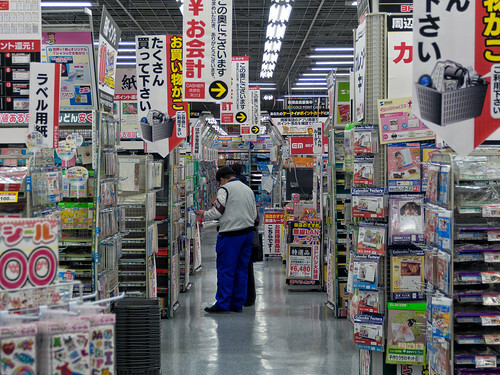 Yodobashi is three jam-packed stories of high technology that just happens to include cameras. 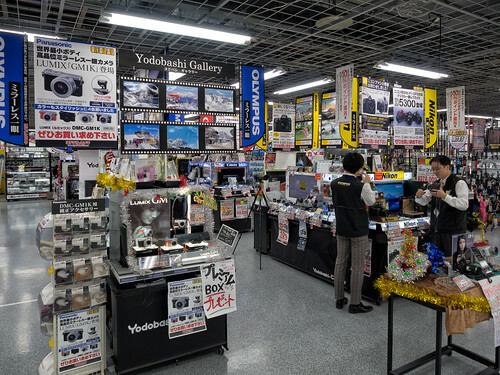 Maybe Yodobashi started out years ago just selling cameras, but today it’s camera section only fills part of the second floor. The building itself is at least six stories, with a three story car garage on top of the store proper. 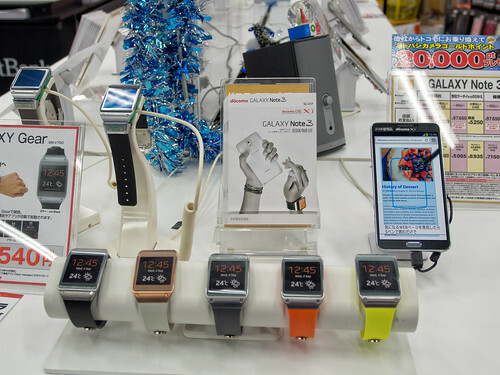 The store sells far more than just cameras. It sells just about everything digital from computers to computer supplies to smart phones and their addons and just about every other electronic and/or digital device currently being manufactured. 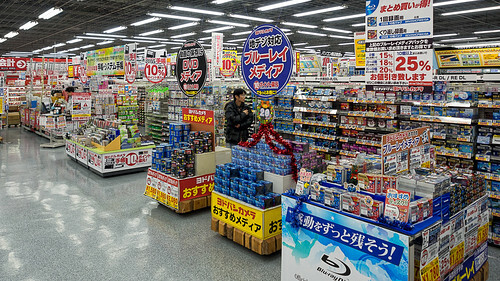 It’s a huge mash-up advertising, a visually loud display of Japanese capitalism and marketing. Everything I’ve ever read about in America and never really seen, I literally saw here all together under one roof. It was overwhelming. 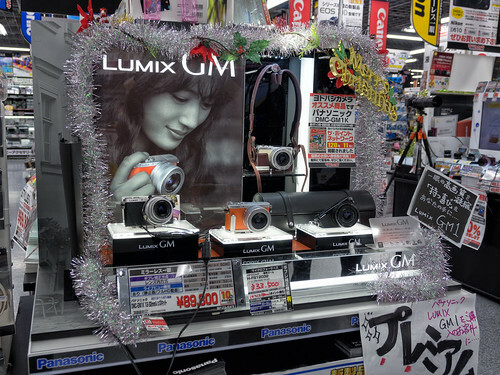 When I finally reached the photography section on the second floor I discovered that Yodobashi had displays for every manufacturer and model of camera currently on sale in every store, online and brick and mortar, that I’ve ever read about, and a few I’d never seen before. It was like I’d died and gone to heaven. I spent far more time looking at cameras than taking photographs of them. What I’ve got here are some grab shots I took when I remembered I’d walked into the shop with a camera of my own. 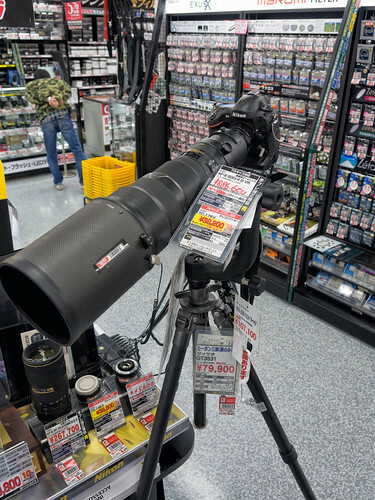 I took the display of the Nikon D4 with the Nikkor 500mm sitting on that Gitzo tripod because of all the money it represented (close to $18,000 based on my calculations and the yen exchange rate the day I shot this). There’s no way a shop in Orlando would have something like this just sitting out in an isle. It would have been locked up in a case somewhere and the only way you would be allowed to see it, let alone handle it, is if you promised to buy one. There were Canon 5DMk3s and 1Dxs on display. Every model of Nikon, including the just-released Df and D5300. Sony α7 and α7r. Pentax K3. 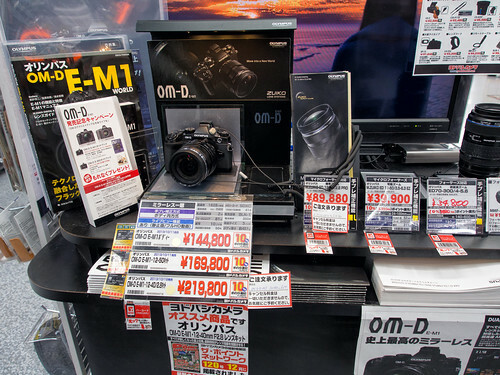 Olympus E-M1 and E-P5. Ricohs and Sigmas. Every manufacturer, every model. All prominently displayed and within easy reach. A true camera geeks paradise. Nikon Df. I was most disappointed in the Df. The model I handled was an all-black kit. When I picked it up I was immediately struck by how overly light it was, almost hollow-feeling. I was not impressed with its fit-and-finish. As the owner of a Nikon N90 film camera, I’m used to Nikon quality (and paying for it), at least with regards to its film cameras. And just to remind myself of the quality of current Nikon digital cameras, I checked out the D610 and D800 that were on display as well. As far as overall quality and handling are concerned, the Nikon D610 and D800 exceed the Df, the D800 by quite a bit. I don’t care if the Df has a D4 sensor in it; the Df isn’t a quality camera for $2,800. If I were in the market for a Nikon digital camera, I’d buy anything else from Nikon before buying a Df. Olympus E-M1. As soon as I picked up the E-M1 with the 12-40mm zoom I thanked my lucky stars I don’t have the budget to buy one. Otherwise I’d have walked out of there with the full kit and never looked back. The E-M1 has more quality/ounce than just about every other camera, and punches far above its “weight class” when it comes to overall handling. Focusing, the extremely quiet shutter, the overall fit-and-finish, the EVF – my E-M5 became quite jealous. It was the last camera I handled, and I paid it more attention than just about every other camera. I left it behind with great reluctance. Pentax K3. I was very pleasantly surprised by the K3. If I were in the market for an APS-C sensor camera, the K3 would beat out the Nikon D7100 and Canon 70D. I loved the handling of the K3 about as much as the E-M1. And matched with some of Sigma’s latest lenses, especially the 18-35mm f/1.8 (which is still on pre-order, unfortunately), I could be quite productive and quite happy with the K3. Everybody Else. In order of preference, they were the Nikon D800, Nikon D610, Canon 5DMk3, Canon 6D, Nikon D7100, Nikon D5300, and the Canon SL1. The Canon SL1 turned into something of a guilty pleasure. I loved the textured surface, and the small size and overall design I found quite pleasing. Many have complained it’s too small, but size wasn’t an issue with me. I would love to see Canon take the SL1 body design and go to a higher overall quality level and capability. I like small cameras like the SL1. The SL1 struck a very positive chord with me. At the right price, I would buy the SL1 with the Canon 40mm pancake and use it. A lot. Note that I am not an ‘L’ lens freak. After an indeterminate amount of time I finally came up for air and discovered it was lunch and I was hungry. So I left with my business partner and headed back out into Sapporo to find something to eat. 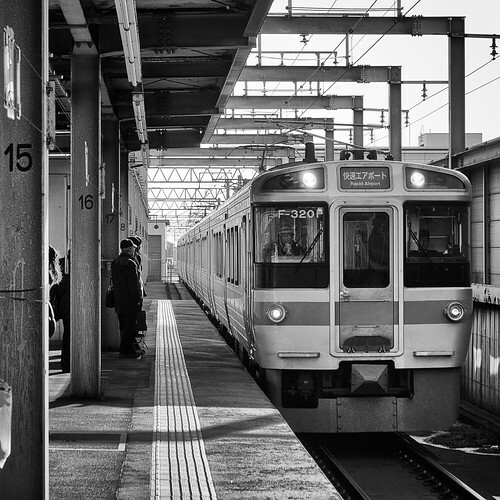 On Thursday, the day after the exercise ended, the two of us took the train to Sapporo. It was a totally unplanned excursion. Sapporo is the capital of the northern island of Hokkaido and is the fifth largest city in Japan as far as population. It was the host city for the 1972 Winter Olympics. Every February it hosts a snow festival. I was tired and still suffering some effects of trying to live 14 hours outside my normal circadian rhythm. It was also a cold and partly cloudy day with snow showers, especially in Sapporo. About all I could do was a very simple six-hour visit, walking around, and not even scratching the surface within Sapporo. Yet, from what very little I did see, it was still fascinating. I would love the opportunity to go back for another day or two and really walk about the city and its outer environs. 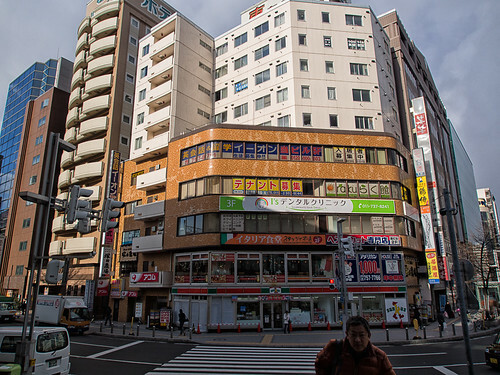 The trip started with our walking to the local Chitose train station that was about two blocks away from the station. Chitose is full of cars, but it’s also a city built for pedestrian and bicycle use. Japan’s cities are so tightly packed that you need paperwork from the local police department saying you have space to park your car before you buy one. Chitose’s streets are always full of traffic of every variety. Chitose is the first trip I’ve ever taken where I didn’t have a rental car and really didn’t need one. And even if I had a rental, Japan drives on the wrong side of the road anyway. The ticket to Sapporo, one way, was ¥830 (a little over $8 US). There are multiple automatic ticket dispensing machines that can be selected to give you instructions in Japanese or English. As long as you have enough cash on you, you can go anywhere. The station is a classic urban design, with the walkin entry and exit on the ground and the train platform above. Two tracks service Chitose, with a mix of high-speed trains to the airport and slower, less expensive trains to other cities. We took the less expensive train to Sapporo. 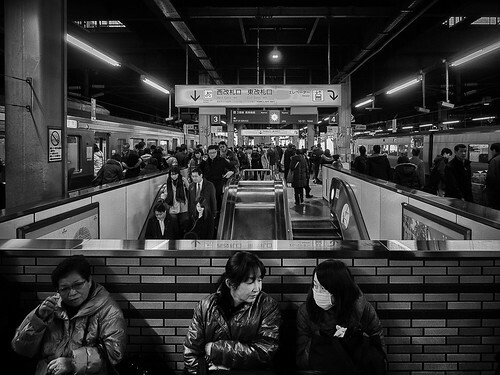 The usual wait between trains is around 10-15 minutes depending on destination. The train was clean, comfortable, and quiet, if utilitarian. It reminded me of Atlanta’s MARTA train system, down to the layout and colors. The trip to Sapporo lasted about twenty minutes. 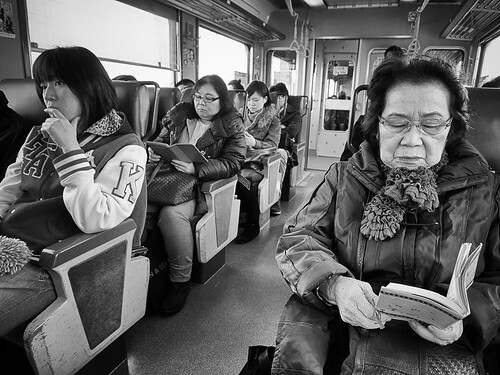 The train not only traveled quietly, but the passengers were quiet. 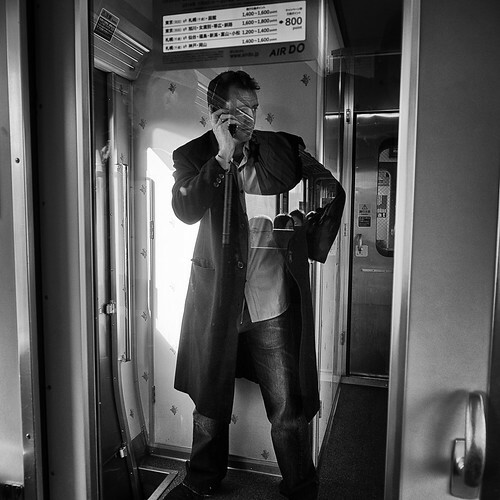 There were signs posted in English and Japanese for travelers to conduct all cellular calls in between the cars, just like this caller. Over the length of the trip he was joined by four other callers in that small area. Whether coming or going home, not once did I hear anyone break the rules with regards to cellphone use on the train. It was a wonderfully quiet and polite trip. 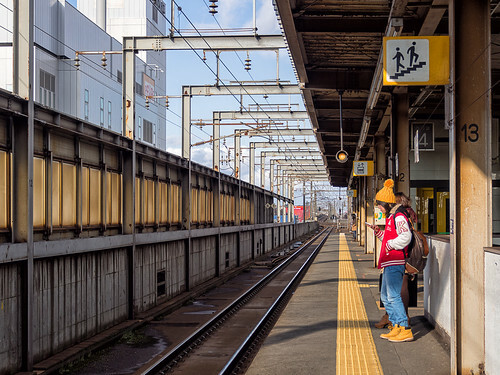 As befits its size as a major Japanese city, the train platform in Sapporo was crowded full of active people coming and going. The lower levels of the train station are jam packed with shops and stores. On the way back to Chitose we stopped off at a local Starbucks (yes, they’re here too) and warmed up with a large hot cocoa. And we did a bit of exploring, stopping in on a number of floors to just be tourists and look at the restuarants and major shopping centers. 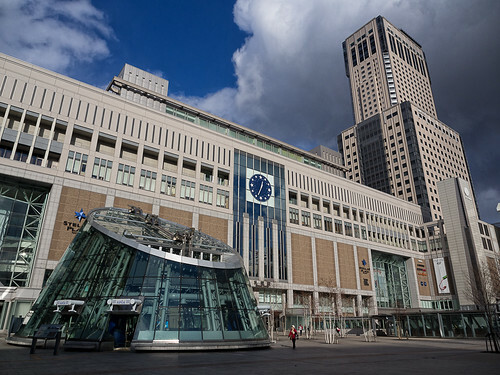 Sapporo’s train station is a big and important shopping district in its own right. I would have taken the express elevator to the observation floor (37th) in the building right next to the station, but by the time I even knew about it it was late in the day, the weather had really clouded up and there was a steady snowfall, all of which was obscuring everything. Stepping outside of the train station started our very brief, if interesting, walk about around Sapporo. Sapporo is a very young city compared to other Japanese cities such as Tokyo. When it was being planned the original city builders used a western grid system to lay it out. Sapporo reminded me a lot of Boston, especially the newly built up waterfront area where I attended the 2011 SISO conference. I wish I’d put more time into planning my Sapporo visit, but I was so happy just to walk around and know I wasn’t stuck in the building I’d been in for all those prior twelve-hour days. Planned or not, going to Sapporo and just seeing what little I did see was more than enough. Maybe one year when I have more time I can properly plan and visit Sapporo. It would certainly be worth it.